You’ll see in the video a breadboard setup driving a 50 V load and also a higher-voltage H-bridge. There are three major topics covered: Using an optoisolator, using a gate bleeder resistor, and using a zener diode to limit gate voltage. [Afroman] is back again with another great tutorial video on the basics of electronics. This time it’s zener diodes. Page three or four of every ‘beginners guide to electronics’ covers a diode as, “a component that only allows current to flow in one direction.” This is true; a diode only allows current to flow in one direction. However, like any depth of knowledge, the dialectic of diodes quickly turns to a series of, ‘but..’ and ‘however…’ statements. A zener diode is like a normal silicon diode, where a forward biased diode will pass current with a ~1 volt drop. When a zener diode is reversed biased, there’s a different voltage drop, annotated as Vz on the datasheet. 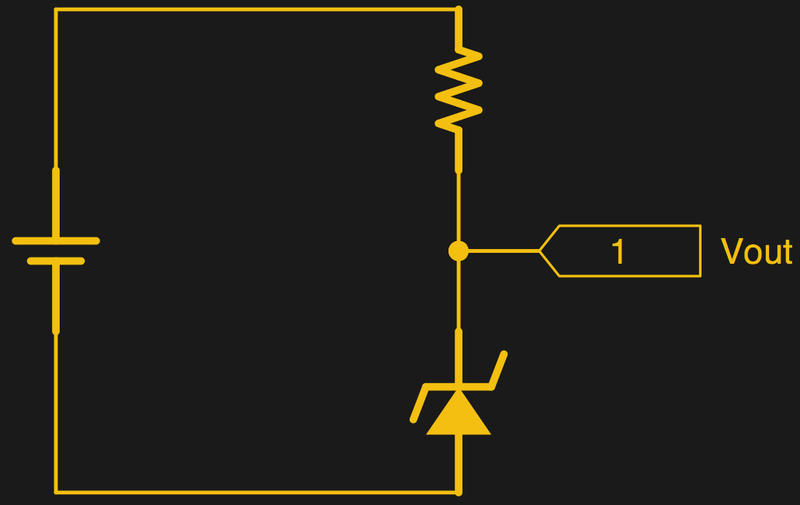 When reversed biased, current cannot flow across the diode unless the voltage is above Vz. This is what makes zeners useful for a bunch of applications. [Afroman] goes over a few of the most useful applications of zeners, including a diode clamping circuit. This circuit will clamp the voltage to a maximum of Vz, helpful when you’re feeding a signal into an analog input. This voltage clamping circuit can be used in some interesting applications. If you feed a sine wave or other signal though the circuit, you can clip the signal. Zeners can also be used as a very crude, low current, low accuracy power supply. If you’re looking for a voltage regulator for a microcontroller that’s impossibly easy and you’re all out of 7805s, pick up a zener. It’s not the basis of a good power supply, but it does work. [Frank Zhao] put together a USB business card. It’s even got the instructions printed right on the silk screen of the PCB explaining how it should be used. He based the design around an AVR ATtiny85 microcontroller. It runs the V-USB package that handles USB identification and communication protocols. The rest of the hardware is pretty standard, the uC draws power from the 5V USB rail, with a couple of 3.6V Zener diodes to drop the two data lines down to the proper level. Once plugged in it waits until it detects three caps lock keypresses in a row, then spews a string of its own keypresses that type out [Frank’s] contact information in a text editor window (video after the break). 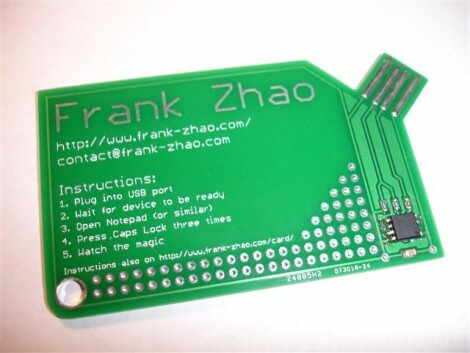 It’s not as reusable as the mass storage business card because [Frank] didn’t breakout the pins on controller. But we still enjoy seeing business cards that make you stand out. This is a great project to tackle with your newly acquired AVR programming skills.